The trees used to make the paper for this product came from sustainable forests. This product was printed using vegetable-based inks and packaged in a reusuable muslin bag. Well eco-Auntie, we thought this was the perfect gift idea for you! Help your niece or nephew- and the entire family - go Green while having fun! The illustrations are adorable, and we think the kids will have a great time choosing an Easy Going Green activity to do with you, their parents, or even on their own! 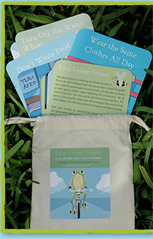 A portion of all proceeds will go to help communities make green changes.